D'arcy Wretzky may not be on board for the current Smashing Pumpkins album cycle, but there were plenty of long-haired blondes onstage with the band at their Tulsa tour stop. After all, Billy Corgan invited locals Hanson to join them for a cover of Fleetwood Mac's "Landslide." 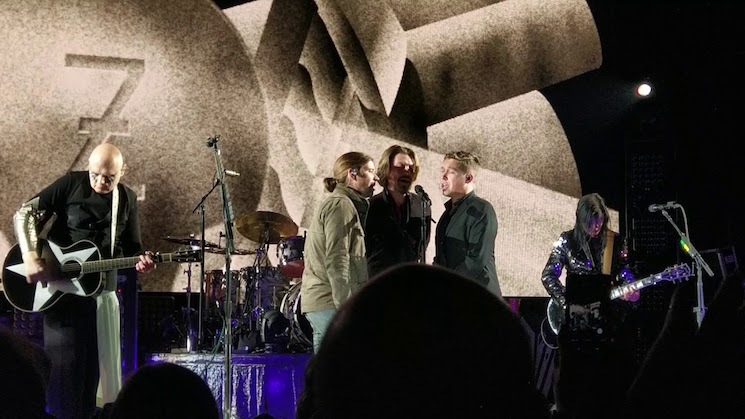 Leading up to the performance, Corgan joked that they saw the members of Hanson busking on the street while they were driving around in a limousine. They then invited the group onstage to perform a rendition of the Smashing Pumpkins' "Landslide" cover, which first appeared on the band's Pisces Iscariot. As with so much about the current Smashing Pumpkins tour, the performance is surprisingly beautiful. That said, we'd love to have heard an amped-up version of "MMMBop." ​Hanson Say Justin Bieber's Music Is "Chlamydia of the Ear"